Kids will laugh and learn as they take a bilingual lift-a-flap journey with some of their favorite fairy tale characters. 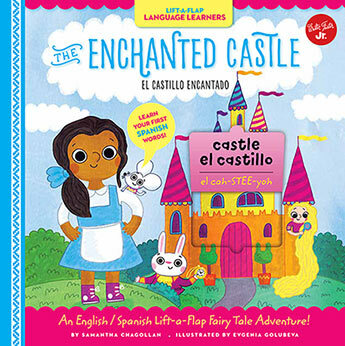 Featuring a fun mashup of familiar fairy tales, including Cinderella, the Princess and the Pea, Snow White, Rapunzel, and more, favorite stories are intertwined to create a new, bilingual adventure in a magical castle. Hidden within each page are flaps with common English words that lift to reveal their Spanish translations, along with a pronunciation guide for each word. Kids will love discovering new vocabulary words on each page as they follow along with the story! Samantha Chagollan is an award-winning author and editor of a variety of children's and arts and crafts books. A native Southern Californian, Samantha grew up with a passion for telling and writing stories. Through the family's art store in Huntington Beach, California, she taught arts and crafts to both children and adults for five years. She went on to earn a degree in literature from Humboldt State University in Arcata, California, where she focused her studies on multicultural literature and the Spanish language. After working for several publishers in the area, Samantha is currently working as a freelance editor and writer and is probably crafting a new story at this very moment.